Stuttgart/Metzingen. The second generation (a first for South Africa) of the mid-range SUV from Mercedes-Benz goes by the name of GLC and represents a big step forward on several fronts: On a technical level the new SUV clearly makes its mark with the excellent standard of safety that is a brand hallmark, featuring state-of-the-art assistance systems and outstanding energy efficiency. Fuel consumption has been cut by up to 19 percent in comparison to the previous model. At the same time, the AIR BODY CONTROL multi-chamber air suspension that is without parallel in this segment, the extended range of DYNAMIC SELECT dynamic transmission modes and the 4MATIC permanent all-wheel drive increase not only the ride comfort, but also the vehicle’s sporty agility – whatever surface it is driving on. Visually, the body follows the clear and sensual design idiom which was demonstrated so successfully by the GLC Coupé showcar concept, and which serves as the standard for future SUV families. The design philosophy behind the new GLC essentially favours sensual purity and a modern aesthetic over the classic off-road look. The dynamic design exudes emotional appeal while also employing purist forms. Surfaces embodying a degree of tension and precise lines cite the clear design line followed by all state-of-the-art SUVs from Mercedes-Benz. The GLC only represents a departure from its progenitor – the G-Class – in terms of appearance, however. On a technical level it sets new benchmarks in all disciplines – the mid-size SUV’s off-road capabilities remain as outstanding as ever. The paradigm shift in the area of design affects not only the outside appearance. The model change also signals a marked upgrade for the interior. 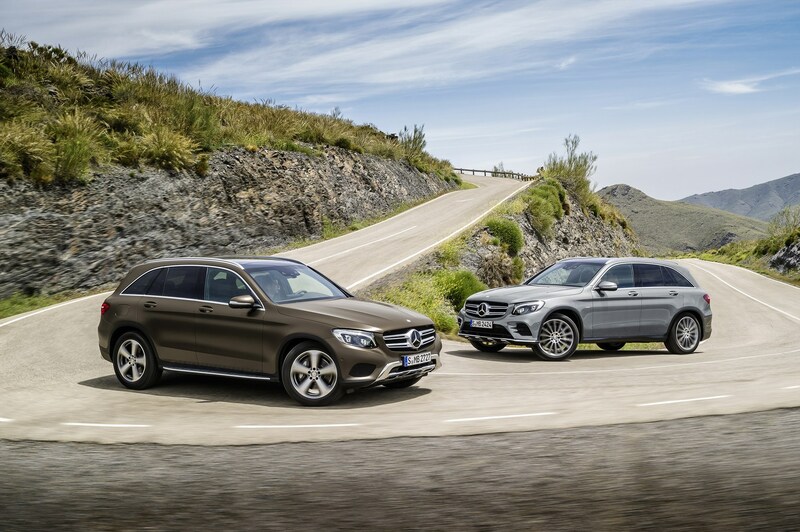 A modern setting prevails, which is quite in keeping with the standards set by its bigger brother, the GLE. The new design idiom combines sensual purity with dynamic sportiness and embodies a new interpretation of modern luxury. The GLC’s interior conjures up the feel-good atmosphere which is a brand hallmark courtesy of high-class materials featuring a hand-crafted character, such as nappa leather or open-pore wood trim, meticulously finished details and an appealing overall touch and feel. Last but not least, substantially more space is available for occupants and luggage. The optional large-area panoramic glass roof further enhances the light and airy feel inside. Through the effective use of space and intelligent packaging, the engineers have also managed to increase the size of the luggage compartment with level a load area and its attendant utility value substantially. The rear bench features a 40/20/40 split and offers a cargo position which increases the load capacity by locking the backrests at a steeper angle. The load capacity behind the rear bench increases by 80 to 110 litres, to a total of up to 580 litres. In all, the GLC is able to transport up to 1600 litres – 50 litres more than was previously possible. The maximum luggage compartment length is 1320 millimetres, while the maximum width increases by 150 to 1100 millimetres. Added convenience for loading and unloading is provided by lowering of the load compartment sill by 40 mm with the AIR BODY CONTROL option and by HANDS‑FREE ACCESS, which enables the tailgate to be opened automatically by performing a swiping movement with the foot under the bumper. All models comply with the EU6 emissions standard and offer a start/stop function. The design transition has also bestowed superlative aerodynamics on the new GLC. With a Cd value of 0.31 and total aerodynamic drag of 0.794, it sets a clear benchmark in this segment. Apart from the vehicle’s substantially more aerodynamically efficient basic shape, this exceptional aerodynamic performance also results from a host of solutions relating to points of detail, such as sealing of the radiator and headlamp surrounds, a radiator shutter, the extended roof spoiler or the optimised underbody panelling. Thanks to an intelligent mix of materials comprising aluminium and high- to ultra-high-strength steels the GLC weighs in at 2 605 kg. Aluminium components additionally reduce the weight of the chassis, which also benefits ride comfort due to the attendant reduction in unsprung masses. The optional AIR BODY CONTROL full-support multi-chamber air suspension features spring elements in lightweight yet robust glass-fibre-reinforced plastic, which reduce the system weight in comparison to conventional air suspensions. The use of the new compact transfer case as an add-on module and the 9G-TRONIC with its magnesium transmission housing results in a reduction in weight of 12 kg in comparison to the previous model. The new GLC features the AGILITY CONTROL suspension with steel springs and a variable damping system as standard. The GLC is the sole model in this market segment to offer the option of fitting the chassis with a full-support multi-chamber air suspension system and electronically controlled, continuously adjustable damping. The AIR BODY CONTROL suspension combines excellent driving stability and sporty agility with optimum comfort and outstanding off-road capabilities. Specific characteristics are pre-selected according to the settings of the DYNAMIC SELECT driving dynamics program. In Sport mode the GLC’s occupants feel as if they are sitting in a sports car with a high level of lateral dynamics due to the tauter connection of the chassis, which is additionally lowered by 15 millimetres. Comfort mode offers the very opposite ride experience, focussing on particularly comfortable running with soft connection of the chassis. To ensure maximum driving safety in this mode, too, the spring and damper forces adapt within 60 milliseconds in response to sudden evasive manoeuvres, for example. When the GLC is equipped with the Off-Road Engineering package, AIR BODY CONTROL optimises the wheels’ ground contact, ensuring good progress in off-road terrain by raising the driving level by up to 50 mm and providing for particularly soft basic tuning. Further benefits of the system include reduced rolling during cornering, automatic level control and lowering of the load compartment sill for convenient loading and unloading. The new GLC offers the DYNAMIC SELECT handling control system with five driving programs as standard. In addition to the ECO, COMFORT, SPORT, SPORT+ and INDIVIDUAL settings which are familiar from other models, the new all-rounder can also be equipped with the Off-Road Engineering package. This comprises up to five programs. “Slippery” and four off-road driving programs are totally new here. “Off-road” is predestined for easy off-road terrain such as gravel or sand tracks. “Incline” boosts climbing capabilities on steep ramps or long, slow uphill stretches. In conjunction with AIR BODY CONTROL air suspension, the additional “Rocking Assist” program offers the last resort, should the vehicle get stuck. Here the driving level is raised by 50 millimetres and the wheel-slip control thresholds are increased so as to enable the GLC to work its way free. The fourth off-road program, “Trailer”, is designed for optimum trailer towing off-road and facilitates moving off on wet grassland, for example. The Off-Road Engineering package further includes a robust Gemtex underride guard, which takes the stress out of heavy ground contact as on the previous model, and Downhill Speed Regulation. The system, which goes by the abbreviated name of DSR, automatically maintains the speed which has been pre-set on the cruise control on steep downhill stretches. The nine-stage 9G-TRONIC automatic transmission also comes as standard on the GLC 220 d 4MATIC, GLC 250 d 4MATIC and GLC 250 4MATIC. Depending on the mode selected for the DYNAMIC SELECT dynamic handling control, the automatic transmission with a torque converter boasts great agility and responsiveness or poised composure. The potential of the transmission is exploited to the full. It offers an impressively high shift speed and perfect transitions for energetic sprinting as well as with gentle, barely perceptible gear changes for enjoyable cruising. Almost all of the driver assistance systems which are familiar from the C-, E- and S‑Class are available for the new GLC. As part of the Intelligent Drive concept, these systems combine data from various sensor technologies to enhance comfort and safety substantially. COLLISION PREVENTION ASSIST PLUS, Crosswind Assist, Headlamp Assist and ATTENTION ASSIST are on board as standard. The Driving Assistance package Plus provides an even more comprehensive scope of active safety features, comprising DISTRONIC PLUS with Steering Assist and Stop&Go Pilot, PRE-SAFE® Brake with pedestrian detection, BAS PLUS with Cross-Traffic Assist, Active Blind Spot Assist, Active Lane Keeping Assist and PRE-SAFE® PLUS. The latter feature also offers added protection in the event of a rear-end collision. By means of a radar sensor in the rear bumper PRE-SAFE® PLUS identifies impending rear-end collisions, alerts the traffic behind by operating the hazard warning lights at a particularly eye-catching flashing frequency, activates preventive occupant protection measures and brakes the vehicle to a standstill after a rear-end collision to reduce the levels of stress acting on the occupants. Greater safety for all road users is provided by Traffic Sign Assist with its wrong-way warning function, which in addition to speed limits can also alert the driver to no-overtaking and no-entry signs. On vehicles equipped with the LED Intelligent Light System, Adaptive Highbeam Assist Plus allows main beam to be left on permanently by masking out the area of the main-beam light cone which is occupied by other vehicles. Simpler handling and a clearer view when manoeuvring in tight spaces or driving in dense urban traffic are ensured by the 360° camera, which is able to show the vehicle and its surroundings from different perspectives, and by Active Parking Assist, which manoeuvres the vehicle fully automatically into detected parallel and end-on parking spaces. Also new is the Head-up Display, (HUD). The HUD displays important information directly in the driver’s field of vision on the front windscreen, thus providing for clear legibility and less distraction from the road ahead. The system provides information on speed, posted speed limits, navigation instructions and messages from the DISTRONIC system. In addition to 3-point safety belts with pyrotechnical and reversible belt tensioning and belt-force limitation for driver, front passenger and those in the outer rear seats, numerous airbags serve to protect the vehicle’s occupants in an accident. These include the combined thorax/pelvis sidebags for driver and front passenger and a newly developed windowbag extending over both seat rows, the optional sidebags for the outer rear seats and a driver kneebag. “The GLC arrives on South African shores in the third quarter 2015 with an unprecedentedly diverse range of equipment that enables customers to configure their SUV according to their own requirements and preferences,” says Selvin Govender, Marketing Director, Mercedes-Benz Cars. “The basic equipment already includes numerous details adopted from higher vehicle categories. Pioneering assistance systems such as COLLISION PREVENTION ASSIST PLUS, Crosswind Assist, Headlamp Assist, ATTENTION ASSIST or an ESP® system with Dynamic Cornering Assist all feature as standard. The optional latest-generation driver assistance package further reduces the driver’s workload while enhancing safety for the passengers, with facilities including DISTRONIC PLUS with Steering Assist and Stop&Go Pilot, PRE-SAFE® Brake with pedestrian detection, BAS PLUS with Cross-Traffic Assist, Active Blind Spot Assist, Active Lane Keeping Assist and PRE-SAFE® PLUS,” adds Govender. The scope of delivery for the GLC also includes the DYNAMIC SELECT dynamic handling control system with the five driving programs INDIVIDUAL, SPORT, SPORT+, COMFORT and ECO. With the Off-Road Engineering package including dynamic real-time COMAND visualisations on the media display, Downhill Speed Regulation (DSR), up to five off-road driving programs, underguard, off-road lights function and driving levels raised by +20 mm (steel suspension) or up to +50 mm (AIR BODY CONTROL). The customer has an extensive range of options when it comes to configuring their GLC. EXCLUSIVE line, with 45.7 cm (18-inch) wheels, radiator grille with twin louvres and chrome inserts, bumpers with a chrome-plated underguard at front and rear, two chrome-plated tailpipes, polished aluminium trim and roof rails in anodised aluminium. AMG Line, with 48.3 cm (19-inch) wheels, radiator grille with twin louvres and chrome inserts, AMG bumpers with a chrome-plated underguard, two chrome-plated tailpipes, polished aluminium trim and roof rails in anodised aluminium. Off-Road Engineering package, with the mentioned technical contents such as the five off-road driving programs and the raised chassis (+ 20 mm, or up to + 50 millimetres on vehicles fitted with AIR BODY CONTROL). Other optional items include the large-area panoramic glass roof with electric roller sunblind, aluminium-look running boards with rubber studs, LED Intelligent Light System, EASY-PACK tailgate with HANDS-FREE ACCESS and the fully electric trailer coupling. For the interior there is a choice of various combinations in fabric, ARTICO, DINAMICA, leather or nappa leather in black, silk beige, espresso brown, saddle brown and platinum white pearl (designo only). Customers can combine these upholstery options with light longitudinal-grain aluminium trim, optionally in combination with AMG carbon-fibre trim or wood elements in brown or black open-pore ash, linestructure lime wood in high-gloss brown, burr walnut wood in high-gloss brown or a black piano-lacquer look. Variations are also available for the roof liner, which comes in black, crystal grey or porcelain. The GLC offers excellent infotainment for its occupants as standard, courtesy of a large 17.8 cm (7-inch) colour media display and Audio 20 USB sound system with Frontbass. In combination with a smartphone with a data option, the system is already internet-capable and further incorporates a Bluetooth® hands-free system. In conjunction with Garmin MAP PILOT, Audio 20 CD becomes a fully-fledged navigation system, integrated into the on-board electrical system. When COMAND Online is installed, the media display increases in size to 21.3 cm (8.4 inches) and has a higher resolution. The further scope of features here includes audio/TV reception, fast hard-disc navigation, current traffic data via “Live Traffic Information”, a WLAN hotspot function and LINGUATRONIC voice control. Concert hall music quality is offered by the Burmester sound system. Interesting and popular individual features for the interior include multi-colour ambient lighting, the AIR-BALANCE package with ionisation and fragrancing, a heated multifunction steering wheel, the heated front seats with fully electric adjustment, heated rear seats and THERMOTRONIC automatic climate control. The stowage facility package keeps things neat and tidy with 2 rolled-up fluorescent jackets in the front door panels, map pockets on the rears of the front seats, a net on the luggage compartment floor, folding box, cargo clamp, lockable luggage compartment floor, 12 V power socket and electric release of the rear seat backrests next to the rear bench seat. A particular favourite which has now become something of a tradition is the Edition 1 model. At the market launch it will be available in a choice of two different interior variants – designo black or designo two-tone. Both versions offer the AMG sports steering wheel, ambient lighting, a black roof liner and the Seat Comfort package with heated front seats. The scope of delivery also includes the AMG Exterior Line with AMG titanium grey multi-spoke 50.8 cm (20-inch) wheels, two-pipe exhaust system, heat-insulating dark-tinted glass from the B-pillar rearwards and the traditional Edition 1 emblems on the wings. The GLC Edition 1 can be combined with all paint finishes and engine variants.